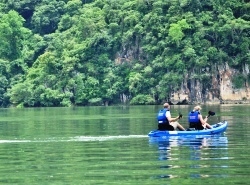 The trekker (GUIDE) will pick you up at your hotel in Hanoi for transfer to Ba Be national park. The journey in a comfortable car is around 6 hours passing through Thai Nguyen city by Highway3. Lunch will be set up at a local restaurant before leaving the car at the trail Start—the Nang river trailhead—then floating to tunnel cave in the Dao Village. We then Start the hike, crossing rain forest looking for wildlife and hiking to the summit of Taken for panoramic views. We then visit Hmong villages before we reach a Dao ethnic village. 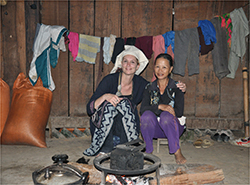 You are Invited to join the host preparing the traditional food which will be cooked on an open-fire And you may enjoy some local corn wine with your meal. Overnight at original Dao house. Traditional breakfast may include noodles, omelet and bananas and could be considered a Luxury in this remote area of Ba Be. Leaving the Dao village, it is a 10km hike to a Hmong Village where we may meet the children in school (It might be nice to take some candies, pens, notebooks as a small gift). We then find somewhere for a picnic lunch near the school, which will be Vietnamese army food! In the last 10 km to Coc Toc village we have to go up and down, crossing the Coc Toc stream where the villagers make a living by fishing on Ba Be lake. If it’s hot, do like the local kids, just jump in the lake! 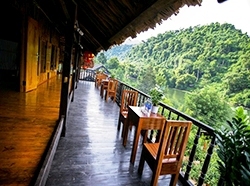 You will enjoy a superb dinner (Mrs Linh is specialist in local dishes) on the river terrace. Overnight in Mr Linh's luxurious Tay house. - We bring you to places normal tours don't go! - From July to September, the climate is usually humid and hot. - From October to June the weather is cooler and more pleasant. - Our experienced and friendly Tour Guide(s) speak excellent English. - Home stay (2 nights). A clean and comfortable home stay with mosquito nets provided. - Private door-to-door pick-up & -off services. - Pack essentials, including light comfortable clothes suitable for outdoor activities, comfortable walking shoes. Take a small day pack for hiking and trekking.